Inventory is the story across the country. Lack of available homes is constraining most major markets, and the Seattle real estate market feels the pinch. Monthly home sales have eclipsed new listings in recent months. The condo market in Seattle is a prime example of how low inventory can affect home prices and affordability. The city has seen a huge influx of technology workers in recent years. Amazon, Microsoft, Google, and Facebook are just a few of the companies relocating employees to the Seattle market. Many of the folks in the tech industry work long hours and prefer an in-city lifestyle. They eschew the long commutes and big yards, and prefer walkable neighborhoods and the low-maintenance benefits of condo living. Unfortunately, there aren’t enough condos to keep up and the problem keeps getting more serious. Inventory of condos available for sale in Seattle dropped to 0.97 months in February. That means for every 100 condos being sold, only 97 were being listed for sale. When markets go above 100% absorption, buyers feel the crunch. Balanced markets are supposed to have 4 or 5 months of inventory for buyers to peruse. The Seattle real estate market hasn’t seen those levels in terms of available condos since early 2012. Year over year, Seattle’s condo inventory is down 39%. For buyers, that means bidding wars and rising prices. The median condo price in Seattle rose to $385,000 last month. That’s 21% higher than just one year ago. It’s not a surprise anymore to hear about a brand new listing that received 10, 20, even 30 offers. Buyers get fed up, but rent prices continue to rise at the same time. The measure of condo pricing over time can be volatile because of the significant difference in building styles and how they fluctuate based on new buildings coming available. The overall trend can’t be denied, though. Seattle’s population is growing, the demand for urban homes is visible and the region’s newest residents want to buy homes near their jobs. 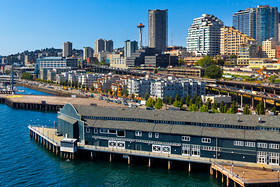 Condo development is at the heart of the answer for cities like Seattle where population growth is meeting with a lack of housing and transportation. Regulation and resistance from traditionalists create significant hurdles and friction for condo developers. Onerous construction fees and lagging liability concerns discourage new entrants. That shouldn’t stop local leaders from confronting the inventory issues head on — because they’re beginning to tower over us. Growth is inevitable. Embracing the change will make the region stronger in the future. Obstructing condo development will only make us feel like we’re preserving the gritty little town that we used to be. That time has passed.